A holiday movie that encourages us to recognize details as nostalgic projections is a priceless commodity, but an endeavor that embellishes them into blatant absurdity can carry a charm all its own. One could charge Chris Columbus of understanding that prospect with clairvoyant accuracy when he made the notorious “Home Alone,” especially considering how it has endured for so long in public favor. Though it was clearly made and released with cynical intentions on part of a money hungry movie studio, the eyes of overzealous young dreamers are drawn incessantly to its simplistic values even now, and as one generation of mischievous kids grows beyond the cartoonish frame of reference of the material, another simply arrives to replace them. Two decades after it dominated the international box office, the idea continues to carry an almost parasitic charm, as if the underlying subtext of young Kevin McCallister’s military-style antics are like narrative devices of adamant rebellion that refuse to fade quietly into the night. That doesn’t place it beyond the restriction of its narrow intentions, but it does give it an edge that holds certain nostalgia over us today, especially as the awareness becomes clearer that good holiday films tend to have no meaningful shelf life. To accept our youthful admirations in the headspace of an experienced adult, I find it necessary to deal with the strange reality of time. A certain need arose in the children of my generation to overthrow the influence of the grown-up world, and many of the youth-focused live action movies of the early 90s reflected that prospect with alarming cognizance. Many of them were hardly films at all, playing more like excursions into the lurid fantasies of daydreamers who grew tired of the influence of grown-ups. 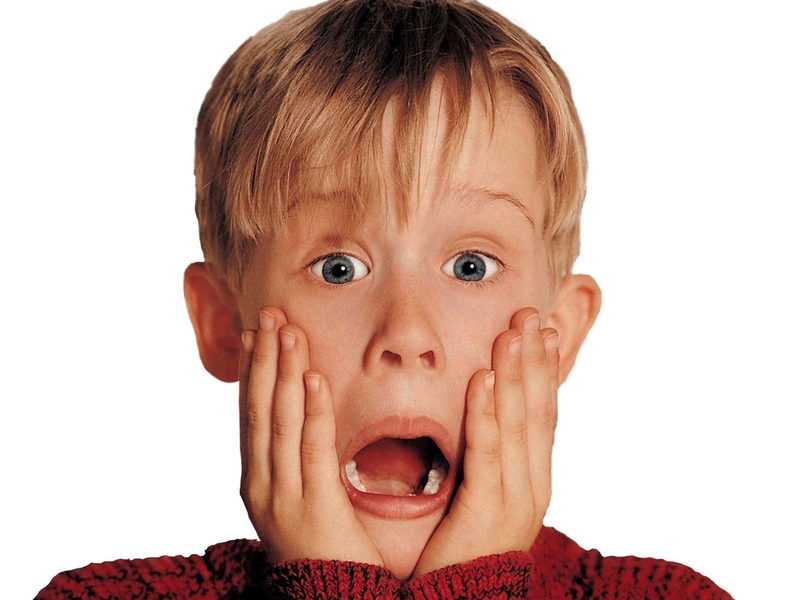 The same mindset that inspired “Home Alone” would eventually give birth to a subgenre of endeavors in which kids and teenagers would break out on their own to escape the structure (or rules) of parental guidance, and a handful of them even turned the tables on them with very horrific intentions (“The Good Son” being one of the more extreme examples). Was there something about the older generation that conflicted with our youthful passions in those days? Why hadn’t the concept been as blatant in the years preceding, especially after the 80s had clogged the release schedule with countless endeavors about the abuse and suffering of children at the hands of irresponsible guardians? If the dialogue was meant to be prophetic, then the ensuing situations help propel the inevitability of his impending conflict. After an encounter with an older brother that forces him into the attic as punishment, he is forgotten about the following morning when the rest of the family rushes off to the airport, eager to begin a holiday vacation in Paris. Their lack of concern with his general presence is played up by the mad rush of being late, and when they finally get around to acknowledging that he didn’t make the trip, the plane is already halfway across the Atlantic. Kevin awakens to make this startling discovery soon after, but his brief alarm is instantly replaced by enthusiasm; no longer will he have to bow to the rules of his adult oppressors, who tend to take the side of others and look upon him not as a normal kid, but as a nuisance more easily tossed aside. But what hope does a boy who doesn’t even know how to pack his own suitcase have when it comes to fending for himself in such a big and lonely house, especially when outside threats start circling the property like vultures staking out a fresh meal? The great capabilities of underdogs often rise to the surface in the most paralyzing of situations, and “Home Alone” supplies Kevin with a lifetime’s worth of scenarios to test his endurance. The primary plot concerns an elaborate cat-and-mouse game he plays with two bubblehead bandits played by Joe Pesci and Daniel Stern, who have strategically scoped the neighborhood in order to burglarize all the houses where families have taken distant Christmas vacations; because the McCallister residence is of particular note, it becomes the crown jewel of targets for them, and poor Kevin spends the duration of the movie coming up with creative ways to throw them off the scent. Meanwhile, his mother Kate (Catherine O’Hara), so racked with guilt over leaving her youngest behind, attempts to make a mad dash back home to be with her son before the impending holiday, and just as her trip is stalled by the reality of busy times in airport terminals, her son’s ruse against the two eager burglars is undermined by their gradual realization that he has been abandoned by the family, and probably poses no major threat against their plan to strip the house of all its valuables. The centerpiece of the movie – indeed, the primary selling point – is a 20-minute climax of elaborate traps and ambushes that Kevin sets up to counter their home invasion, ranging from blow torches to exposed nails to falling paint cans and even tarantulas. As victims of his devious plots, both Pesci and Stern, fully committed to their characterizations, show a great dexterity of comedic flair that fills the screen with great energy. What happens to them during their descent into the house is often painful and shocking, but they play up the humorous underpinnings by offering the camera a variety of precious reactions, as if victims of falling anvils dropped on them by Bugs Bunny. Viewers looking at them from more literal perspectives will find them too violent to be at all funny, of course, but such ideals undercut the cartoonish thrust of the source. The screenplay by John Hughes is a celebration of an ambitious child’s perspective, and to hold it to any grandiose standard beyond that frame of reference violates the principal of the direction, which is no more serious than any Saturday morning cartoon of the same time period. Does the depth of my admiration change in the more informed context of a 30-something, though? In some regards, yes it does. The premise is a logic loop that would never fly for any other sake, and many of the adult characters are drastically downplayed in the logistics of the plot. But none of that diminishes the value (or the enjoyment) of any of what works, either; I still laugh hysterically at most of the painful sight gags, admire the brilliant humor and chemistry of Pesci and Stern, and am humbled to admit that the ending, a good blend of nostalgia and important emotional insights, does inspire a moment of joyous reflection. There are peaks and valleys worth of sensations in “Home Alone” – some of them momentary, others silly, some totally miscalculated – but neither Columbus nor Hughes ever pretended to be achieving something more than a parade’s worth of surface reactions. When you get right down to it, their agenda reflects that of the animators of the Looney Tunes shorts, who too bent the rules of plausibility for the sake of inspiring one to respond jarringly against the flow of gradual consideration. 25 years later, here is a movie that sticks out in the memory not because it is cynical or completely ridiculous in its angst, but because it portrays it all with an over-the-top orchestration that creates a routine of pleasure and enjoyment. And somehow, someway, we still come to accept young Kevin as the hero we always desired to be: an adolescent brave enough to stare back at the nonsense of the world, embrace his rebellious immaturity and teach all the older sorts a lifetime’s worth of important lessons. Author's Note: This article was originally started in December of 2014, but has since been tweaked and finished for publication.